As you may have heard, we just had Thanksgiving long weekend in Canada. I had an amazing weekend with family, fully catered by yours truly and my kitchen-smart fella. I have zero pictures of the end results, but I promise it was delicious. We even threw together this brussels sprouts recipe from Megan at Stetted blog last minute and it was delightful! For once in my blog life, I am not here to brag about the food I ate. Instead, I am here to talk about the surface we served the food on. It always blows my mind seeing pictures of large family gatherings where everyone appears to be eating on one long table that seems pretty permanently fixed within the house. Let's face it. 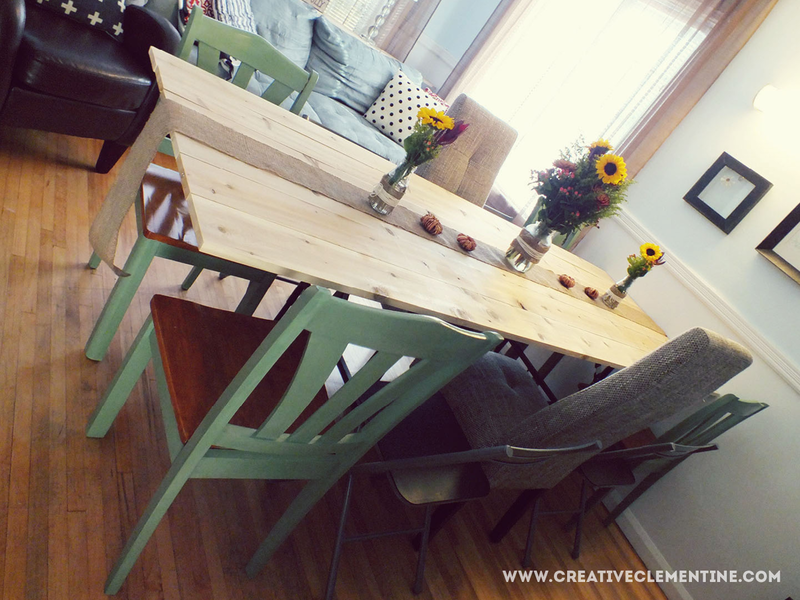 I have a small house (square footage-wise) and don't host a lot of formal dinners. Devoting an entire room to a ginormous table for hosting Thanksgiving dinner seems like something I would be all for... but I do have a shred of sense left in me. In a pinch, I wanted to be able to turn my living room into a room big enough for family dinners--which, in my world, usually means space for between 12 and 20 people. But I have to be able to live my life the rest of the time! 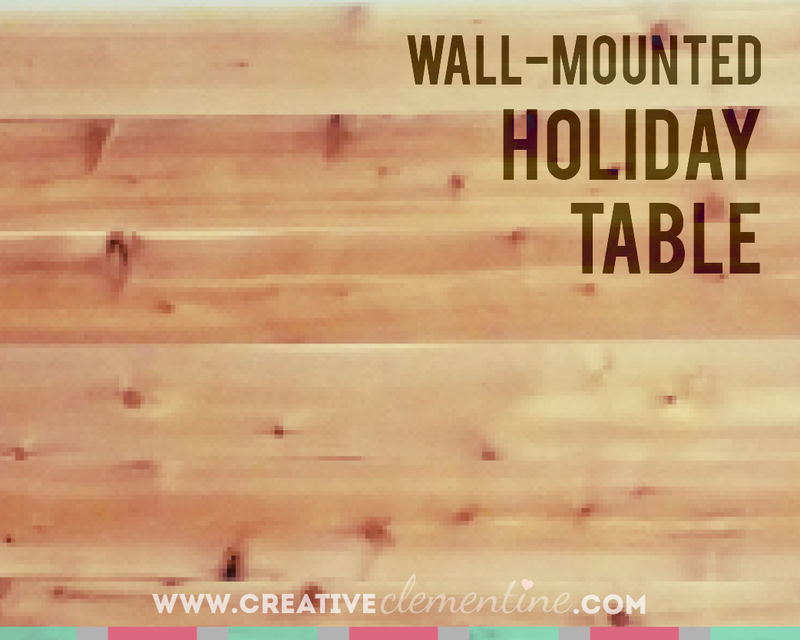 After seeing a post on Apartment Therapy about mounting a folding table to the wall, I came up with a similar solution: a wall-mounted table top for use on special occasions/holidays. After deliberating material options, I finally decided on unstained cedar planks. It adds a bit of rustic charm in a dining setting, and the wood is super light and resilient (not to mention smells amazing). To make the tabletop, I went to Home Depot and picked up six thin planks of 8"x10' cedar and a couple of 1"x4"s. Boards/planks of whatever length and width to suit your purposes will also work. Sand down the rough edges before beginning, since you will probably avoid that task like the plague once it is on the wall. To make the tabletop, I laid the 8x10's down on two sawhorses, and cut the 1x4s so they would fit perpendicular to the cedar boards, stopping mid-board on the ends. Using basic wood screws, I attached the 1x4s to the cedar, using two screws per plank. I made sure to keep the boards as tight together as possible to avoid gaps. I then attached two metal french cleats to the underside of the table top and to the wall. The packaging for the cleat states they can hold up to 150 lbs, and I would be shocked if this table weighed even 50 lbs. I erred on the side of caution by using two cleats to balance the weight and give me some added peace of mind. I originally planned on making my own french cleat out of wood using 2x4's, but I don't have any fancy saws. So, I shelled out the extra $20 for metal ones. Below is a shot of the tabletop on the wall, and off the wall where you can see the cleats. You can also see my weirdly placed vent. One of the perks of having an old house. The tabletop sits on top of a smaller table in order to create enough surface area for eight or more people. Last year, we sat 17 bodies around it, and this year we only needed 12 and it was an easy fit. I'm sure with a bench or something to conserve space, we could easily fit a full 20 people around the table for a holiday dinner. We aren't afraid of getting cozy in my family. Now, as with any improvised system, there will be downsides among the perks. Downside number one: this table is not as wide as your standard table. I keep the turkey etc on my smaller every-day-use table in the kitchen for serving purposes, and the table itself is strictly plates and elbows. I made use of a console table to hold extra napkins and cutlery within arms reach (and to make a pretty display of it with the Sea & Lake print that I won!). Downside number two: Any table with this tabletop added to it will completely eat the room it is in. My living room, as you can see in the pictures, was devoured by table. 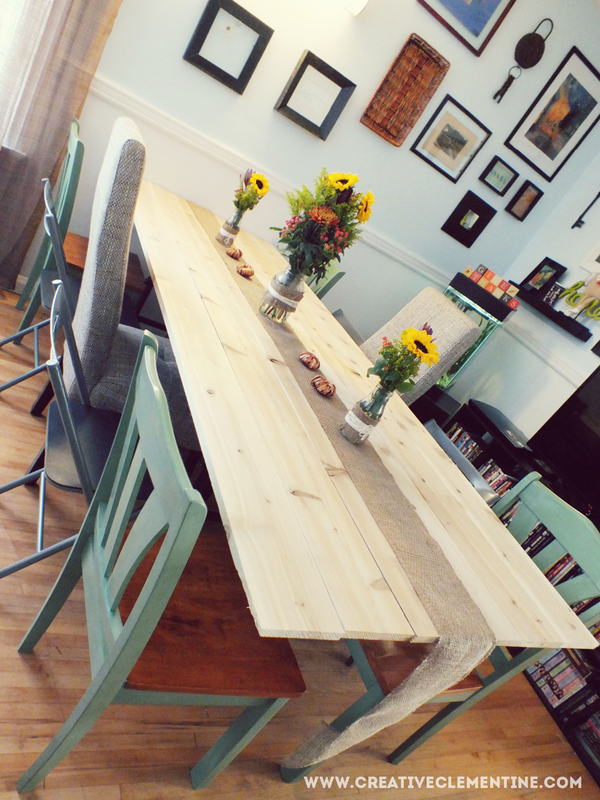 I measured the max length before deciding on a ten foot table... And I lucked out when I realized I could fit it in the room two different ways (last year it was the other way, to fit more people). Downside number three: This is not something that is easily taken down or put back up alone. If you don't have backup, this might not be the best solution for you. Downside number four: There will be no table dancing on this bad boy... which may or may not be an issue in your family. Keep small children and intoxicated adults from jumping on the unsupported sides and you should make it through your gathering injury-free. I've been playing with the idea of painting a quote or image on the cedar, to jazz it up a bit when it is on the wall. But there is something nice about the simple wood grain, so I haven't touched it. Do you have any ideas for whether I should add a design or keep it plain wood?? Would love to hear your thoughts! Okay, so this is BRILLIANT! Thanks for sharing it at Link It or Lump It this week! That is a genius idea! Seriously Brilliant! Found you on think and make thursdays, Congrats on being featured!! I run a link up on my blog if you are ever interested in joining! I'm a Winner! Tell all your friends. 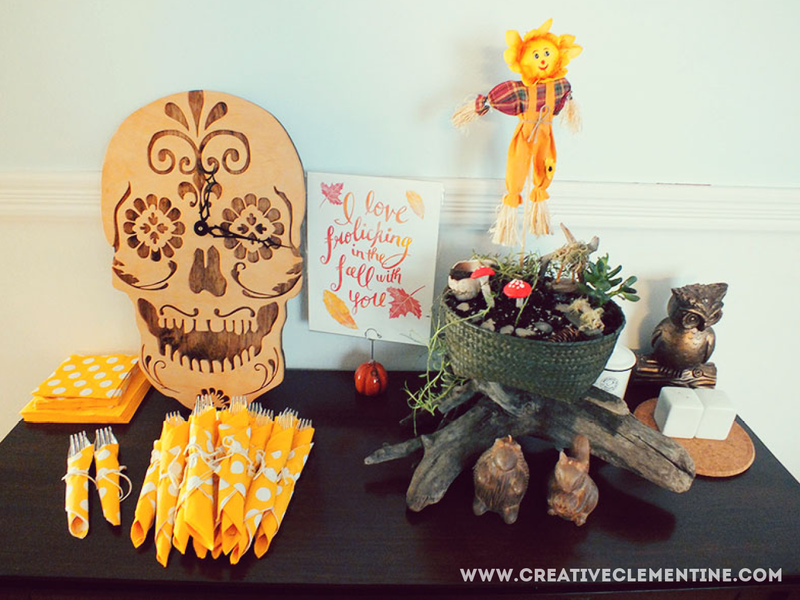 Pumpkins and Cinnamon and Zombies...Oh my!